U.S. stocks closed sharply lower Thursday as traders were worried the Fed would raise rates while the economy is too weak. Investors also awaited Friday's nonfarm payrolls report and weighed disappointment over the level of euro zone stimulus after the European Central Bank's decision. 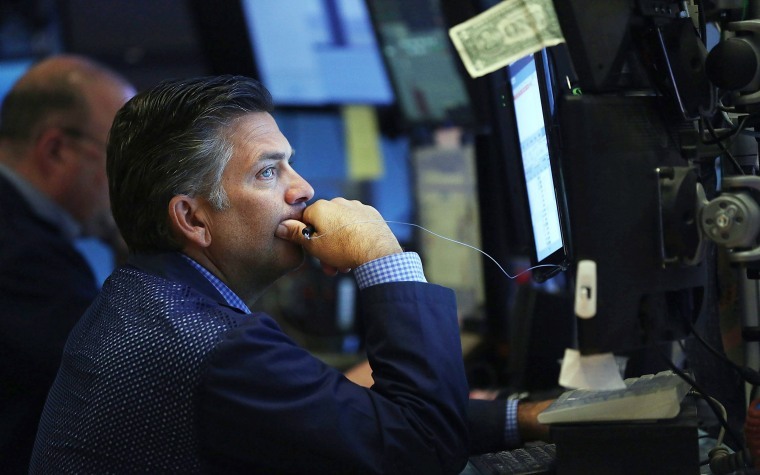 The Dow Jones industrial average fell 250.47 points, or 1.41 percent, after briefly falling more than 300 points; the S&P 500 lost 29.75 points, or 1.43 percent; and the Nasdaq Composite dropped 85.70 points, or 1.67 percent. "I think the market's a little bit more focused on the Fed moving on rates and the pace going forward. ... Additional rate hikes may be coming and the economy really isn't that strong but for some reason the Fed thinks it is, all because of the jobs number," said Robert Pavlik, chief market strategist at Boston Private Wealth. Traders also said markets were still on edge over the latest news surrounding Wednesday's shooting in San Bernardino, California. The motive in the killings was unclear. Treasury yields held mostly higher, with the 10-year yield around 2.33 percent but the 2-year yield coming off highs of near 0.99 percent to trade flat at 0.94 percent as of 3:46 p.m.
"The market is responding to what Janet Yellen is saying and (her) being more optimistic about growth," said Patrick Maldari of the North American fixed income team at Aberdeen Asset Management. In a testimony before Congress Thursday, Fed Chair Janet Yellen reiterated confidence in the U.S. economic outlook. Her remarks followed a speech Wednesday that reaffirmed the case for the first interest rate hike in nine years as soon as this month, if the data is supportive. Her comments briefly sent the U.S. dollar to its highest since April 2003. Qunicy Krosby, market strategist at Prudential Financial, said ever since Yellen indicated lift-off could come this year the market has been nervous and interpreting bad news as good news that could keep the Fed at bay. "This tug of war means there is no direction in the market. Tomorrow it could all change. That's a market trying to decipher where we are headed but the road is going to be choppy. ... The deeper we go in December, the volume in the market tends to dissipate, which means the swings can be exaggerated," Krosby said. Analysts said Thursday's dramatic moves in parts of the market could reverse after the jobs report Friday. U.S. stock index futures dipped in pre-market trade after ECB President Mario Draghi said the central bank would extended its asset purchase program to at least March 2017 but did not increase the amount, falling short of expectations. "Investors were really rallying around the ECB and the Bank of Japan to continue easing and today's press conference was a disappointment in that regard,” said Jack Ablin, chief investment officer at BMO Private Bank. “We had pretty high expectations. ... The next big thing is really Friday, tomorrow, on the jobs number." The U.S. dollar index fell more than 2 percent to below 98 in afternoon trade Thursday after hitting a plus-12-year high of 100.51 Wednesday. The euro extended earlier gains to climb above $1.09 in late-morning trade. The euro began rising ahead of the ECB decision after an inaccurate FT.com report said the central bank unexpectedly kept interest rates unchanged. The Financial Times later issued a correction. "I think you've got an equity market that's trying to recalibrate to ... currencies and bonds that are moving more than they usually do," said Art Hogan, chief market strategist at Wunderlich Securities. The ECB also cut its deposit rate to negative 0.30 percent from negative 0.20 percent, while leaving the refinancing rate unchanged at 0.05 percent. The German 10-year yield jumped above 0.6 percent. European stocks gave up gains to close sharply lower. "It's almost as if Yellen and Draghi were coordinated. ... Not only did you have the compounding of the same message you also have an effect where European government yields have risen significantly. That gives us more room for U.S. interest rates to rise," said Brett Wander, chief investment officer, fixed income, at Charles Schwab Investment Management.